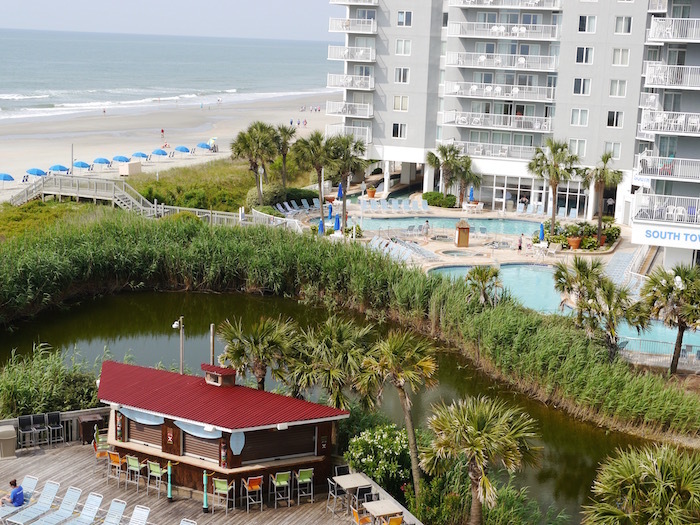 Having never been to Myrtle Beach before, or South Carolina at all for that matter, I count myself as lucky that my first experience included a stay at Sea Watch Resort. From check in to check out, my boyfriend and I felt positively spoiled and were able to fully relax after a whirlwind month of dieting, competing, graduating, and more. 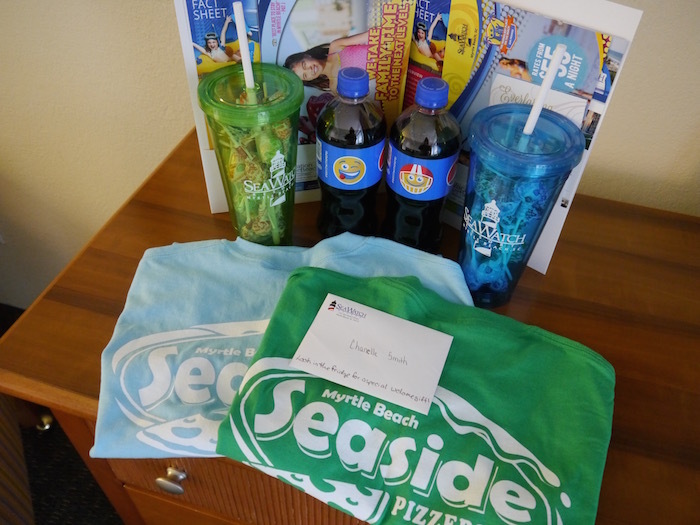 When we walked into our ocean front suite at Sea Watch, we were greeted by this cheerful display of welcome goodies. The note told us to check the fridge for a special treat – a beautiful cheese and fruit plate! While we were in fridge-checking mode, we unpacked all of the food we brought along with us on the trip. Both of us are frugal, so we toted along plenty of things to eat, but amazingly, we didn’t touch any of it because we dined like kings at all the fantastic restaurants that graciously hosted us over the weekend. 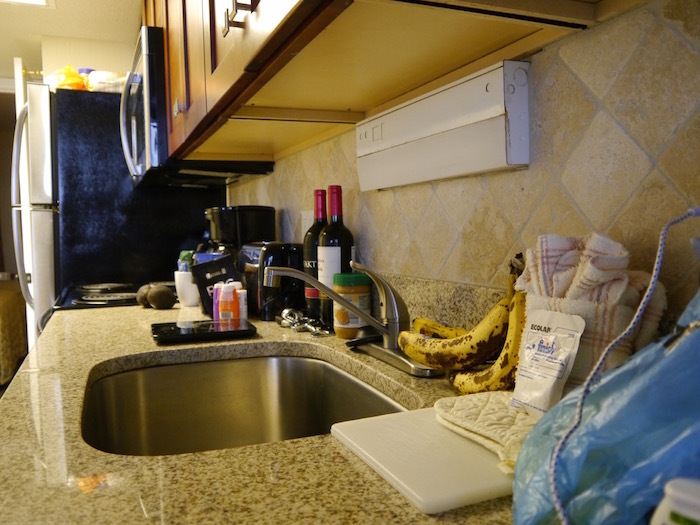 If we’d needed to cook, we certainly could have, because the kitchen included a fridge, microwave, oven, dishwasher, coffee maker, toaster, and as you can see below, lovely granite countertops. Once we got everything put away (typical type-A people), we stopped to admire the beautiful ocean view. Because of the way Sea Watch Resort is designed, every single room in its North Tower has a patio with a full view of the ocean! Beautiful pool area. We spent a lot of time here! We got into Myrtle Beach in the evening on a Thursday, ate dinner, and then headed right down to the pool and hot tub area for a night swim. The resort includes multiple pools, hot tubs, and lazy rivers, and as you saw above, a tiki bar! We FULLY took advantage of the tiki bar. For those of you who read Dating While Weird, this is the younger man! Isn’t he a babe? We could not have asked for a better resort experience for our first trip to Myrtle Beach! Thank you, Sea Watch, for your hospitality and complimentary stay. You truly are the friendliest place on the beach. You, too, can stay at Sea Watch and be a beach bum like we were! Sea Watch had an equal split of couples vacationing alone and families vacationing with kids, so it would be a good choice for whatever kind of beach trip you’re taking. 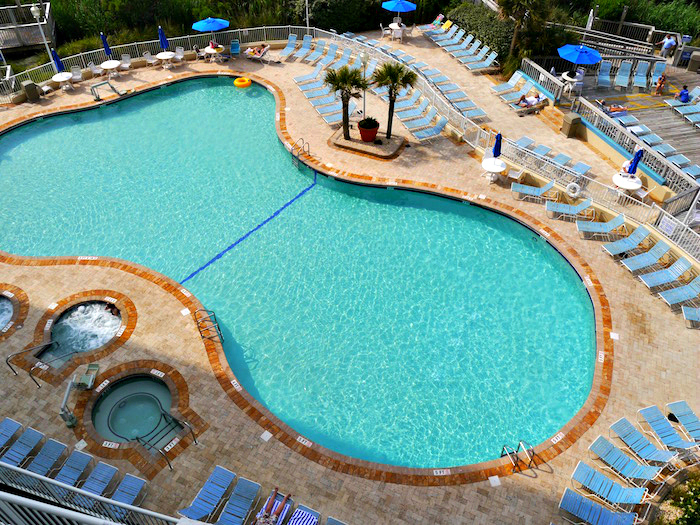 You can book your room at Sea Watch or at any of the other VMB resorts at VacationMyrtleBeach.com! 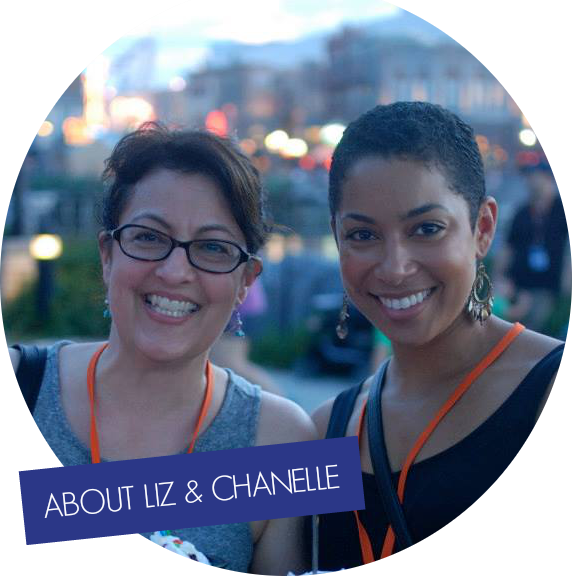 Chanelle is a yogini, techie, millennial, and recovering unsolicited advice-giver. To catch a Chanelle, set a trap containing one or more of the following: sesame tofu, 70s music, memes, kittens. It has been 2 months since we moved to north carolina. Visiting myrtle beach is on our bucket list for this summer.But don’t know when. Will check for this resort when we plan. Thank you for sharing with us at #HomeMattersParty . We would love to have you again this week. This is a very relaxing view. I would also be very delighted to wake up in the morning and have this as my view. Wish I can go and have a vacay anytime. Sounds very relaxing. This is something I’m sure my husband would love to do one day. Thank you for sharing! WOW! look at that view. I would love to wake up to that. I hope I can visit that resort someday. Wow! That’s a beautiful resort to stay over the weekend or holidays. Hope I can go there someday. I’ve heard of this place but never had chance to go there. This is a perfect destination for vacation and I look for places to visit this summer, this might be the one. I have always wanted to travel to Myrtle Beach. It looks like it was such a great time in the sun! Girl do you know I was supposed to be doing a hotel review at Myrtle Beach too? I broke my hand which prevented me from going…so I have to live through you. Go girl…I am like you and need to change like you…I always date guys old or my age. Maybe I need to date a few years younger and see what happens…he is a cutie! I have never been to Myrtle Beach. I would love to visit someday! This looks like a great place to visit! I’ve never been to Myrtle beach before! Myrtle Beach is gorgeous. You’re making me want to go back! This is perfect place to get away from hustle and bustle of a daily routine. What more we can ask if the ocean lies right in front of our eyes. You guys look so relax, and had great time. This is perfect place to get away from hustle and bustle of a daily routine. What more we can ask if the ocean lies right in front of our eyes. You guys look so relax and had great time. This looks like such a great and relaxing vacation! Myrtle Beach is such a beautiful place. I’ve stayed here!!! We were on one of the top floors and it’s really high up! Great views though even if I did get a little vertigo! haha We drove down from VA to Florida and stopped here and also in Georgia, definitely a trip I’d recommend to do and this is a great little spot to stay for a few nights! The resort looks relaxing yet fun. I feel like it’s time to some getting away ourselves. You make want to take my swimwear immediately and go to that resort. Haha. Chill vibe indeed. I want to let you know that I already left my comment in your other post, “Dating but Weird”. It was so sweet of you writing about your boyfriend and you. By the way, I love to go to the resort someday. The views were so beautiful! What a beautiful resort! It is amazing! The resort is beautiful and I love the views. This looks like a relaxing place to get away to. omg I get so jealous. I want to go there the place was really look amazing. I can say that the resort is properly named. From the pictures, it truly is a “Sea Watch” resort. I could spend hours just sea watching. It’s so relaxing. What a view from your room. I love it! I can see myself at that resort. I love how close this resort is to the beach. Beautiful! Sounds like you guys had a very good time. Their resort looks beautiful. Well, I envy you that’s the first thing I can tell you. The pictures are awesome but the view is insanely good. That’s some crazy sand or I am crazy? It’s too flat and perfect! I would like to wake up like this, seeing the beach in your hotel room. You are so lucky, the place you stay with looks very nice. WOW! I am so very jealous at the moment. I want to be on the beach, just to walk and the beautiful scenery. The resort looks wonderful as well! The view is amazing and that pool… =P I’d be in heaven. I am glad you are happy with your boyfriend – he is a looker. BTW I cannot even tell an age difference in the photo. I love the pictures you posted here. I like to spend my summer vacation on the beach and I choose resorts with wifi connection so I can still update my work. I lived not far from Myrtle Beach for many years but I’ve never visited this resort. Glad you had a good time! What a great resort! I love how every room offers a beautiful sea view. The pools look amazing as well. I would love to spend a vacation like that. The pool looks so nice, my son will love to play on it. I love to have a vacation like yours, I want to wake up one morning with a front view of a wonderful beach. This looks and sounds like a wonderful resort. I love all the details you provided including what types of people vacation there. It is hard to find that part out before traveling sometimes. Nothing beats beachfront with an ocean view. The sound of the waves and the fresh air always makes for a great night’s rest! You look like you had such a great time! I can’t wait to get more beach time in. What a beautiful get away you had! Loving the ocean views! Sea watch resort looks amazing!! We have not taken a family vacation in many years, which makes this look even more lovely. I use to love taking vacations at Myrtle Beach when i lived on the East Coast. Sea Watch looks like an amazing resort to plan a vacation at. Woah!!! your tattoo is EPIC! What an amazing place to stay at, I love the pics especially your view. Such cool branded merch too. We’re not too far from Myrtle Beach. My sister was actually just asking if I knew of a good place to stay there! I go to MB at least twice a year. I have never stayed here, but it looks nice. It looks so beautiful at the Sea Watch Resort. It’s always nice to have a kitchenette when members of the group have dietary restrictions. You can safely make a meal that won’t cause any problems. 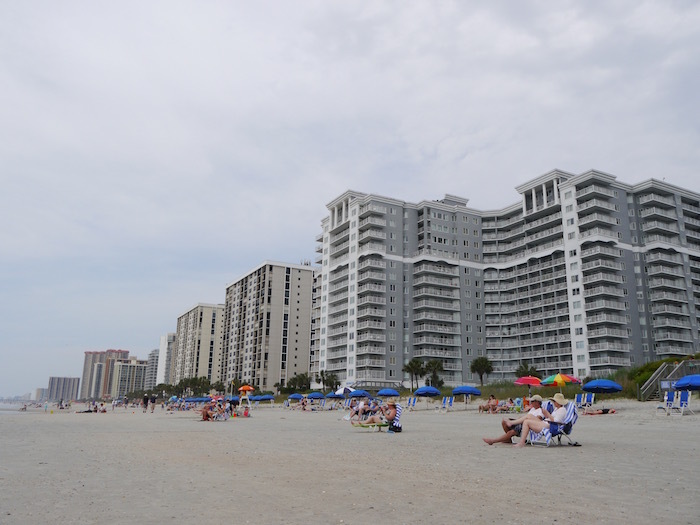 Thanks for sharing the pictures and information about your stay in Myrtle Beach SC. Looks like a great place to sit back and relax! I love the idea of sitting around hearing the sea waters! Looks like such a fantastic time. Love seeing the photo of you two together! I need an ocean trip! Wow what an amazing hotel, it looks absolutely stunning and friendly too! You guys make such a lovely couple and sea watch resort looks amazing! Yes I remember reading the younger man post and it was my favourite post of yours so far. Myrtle is our all time favorite beach to visit any time of the year. The shopping is great there too. I’m sure you guys must have visited Restaurant Row with a zillion places to choose from. I grew up going to Myrtle Beach in the fall for the fishing. It’s a long drive, 8 hours, but worth it! I’m getting major vacation jealousy lol!! Who doesn’t love to chill at the beach with their man?! The hotel looks great too, it looks like you guys had a ball! Dang, so you get to wake up next to the ocean and kiss that younger man?! good for you! I’m usually attracted to older men, but as I get older the younger ones are looking pretty good! lol You hold on to that younger man : ) have fun! Sounds like a great trip. I’ve not been to Myrtle Beach in a few years, we should totally go back and take the kids. I can’t wait to read about all the great things you ate. Love the pic of you and your man! Oh so cute. looks like a really great place to wake up. Looks just beautiful! Oh, I live resorts like this one. You have easy and short access to the sea, what a great view from up. What a view that resort had.Looks like a beautiful place to visit. I have never been to Myrtle Beach, but heard so many people like to vacation there. The resort looks amazing and this is one place to keep in mind. What an awesome looking resort and time! Yes, the younger man is certainly cute too! Score! Your article makes me yearn for the ocean, walking along a beach. I have not heard of this place, but it sounds nice. Myrtle Beach is such a wonderful vacation spot. There is something about spending time near the ocean that fills a person with energy, hope and good feeling. Sounds like a great place! I might check it out in summer, because I gonna be in this area. This looks so pleasing to the eye in the hot summers that we are having now in Manchester. This looks like such a beautiful place. The beach looks so peaceful and serene. I would love to take the family on a vacation here. I would love to visit this place. Love the look of the pool. What a beautiful resort on a beautiful beach. I’m not sure if I’d ever come back home! Oh wow at the views. I’d love to visit there sometime. My mom and step dad used to go all the time before he passed away. I have been wanting to go for a long time now. What a lovely resort! I have never received a fruit platter in my room, that’s really cool. When we travel with our kids we always try to book a suite with kitchenette just in case they wanna make quick snacks. This place looks very family friendly and inviting. Wow! Look at this paradise. I would love for my family to visit the beautiful beach in the Carolinas. Growing up in a tropical country, I missed the salty water of the beach. Here in NY, they call it beach but the water is not salty. Sea Watch looks like it’s a great resort! I love the ocean views. 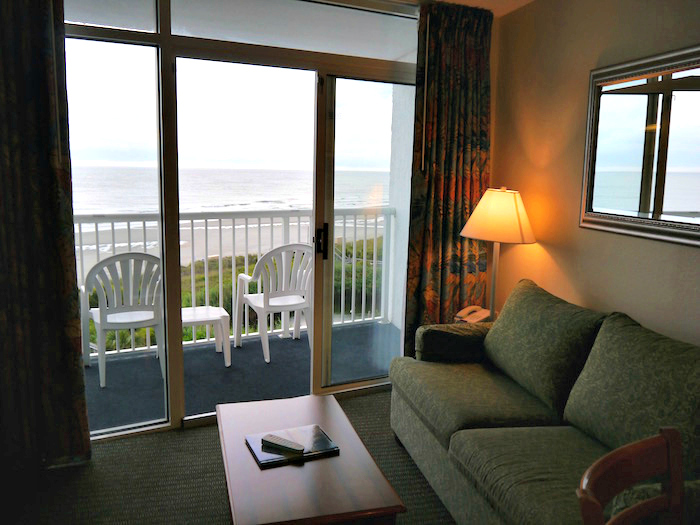 When I stay at the beach, I definitely want an ocean view from my room! We visit the states once a year and Myrtle beach is definitely on our list! That’s one awesome hotel view. This looks like a beautiful resort to relax at. Sounds like you had an amazing time. IT does look beautiful! I would love to stay here one day, it sounds like a great place to stay. OK I’m just so jealous! Some point to go to get down to Myrtle Beach the boy the hotel you got there right on the beach I don’t know if I’d ever sleep at night because I was sit there and just watch the ocean. Beautiful pictures! It looks like a great place to visit! Love the ocean and the hotel views!!! Beautiful photos! It looks like a great place to place in, I love the sea. 🙂 Thanks for sharing! Gorgeous resort! I want to go there right now! Ah now that’s a nice view. That alone would be my selling point. 🙂 Glad you had a fabulous time, and yes, he’s a babe. You guys look fantastic together! I love the views and that pool looks refreshing! The water is so blue. I have been to South Carolina and it is a nice place indeed. Looks like you had fun! Those are some really nice views. I often visit beaches but rarely stay there to enjoy it. I’ll be sure to include the Sea Watch resort in my list. It would be awesome to wake up next to the beach and hang out all afternoon near the shoreline. It’s the perfect summer vacation. Good to know that the staff is accommodating and very friendly, that’s what I love about hotels! I always say “why go to the beach and not have a view”? Looks like you got an awesome one in Myrtle Beach. Sea Watch looks perfect. Awesome place for a vacation! I love going to the beach, but work and other responsibilities have me tied down. I am keeping tab of Sea Watch resort. This will be where we’ll stay when I get to travel to Myrtle Beach! I have MB on my list of must visit places. I travel with the dog so as long as I find pet friendly, count me in. Looks amazingly fun. I saw lots of people walking their dogs along the beach! What an amazing place to stay! We love Myrtle Beach! Myrtle Beach looks like a beautiful place, I’ve never been there but thanks to your post I really wanted to visit. Chanelle, it goes without saying that the handsome younger man of yours is SO LUCKY to get to go on a blogging trip with you and spend quality time together. Glad you both really enjoyed this trip. I am totally like you- I pack food and then HAVE to put everything away! Such an amazing view- I wish I had a Myrtle Beach vacation planning for this summer! Wow, what a beautiful place! I definitely want to visit Myrtle Beach now! What a gorgeous resort and that view/pool! Amazing!!! My family is from Conway/ Myrtle Beach area. Beautiful area to say the least! I love the place you were staying at. Great view of the ocean! We always drive through Myrtle Beach but never actually stop for a visit. This looks like a good place to stay. Love the Tiki Bar and pool area! I haven’t been to Myrtle Beach since I was a kid. This place looks like an amazing one to stay at. I would love to take a trip there this summer. I have always wanted to go visit Myrtle Beach. This hotel looks fun and has a great pool. And that beach looks so relaxing! i hear it is a lot like Cape Cod down there! That is an amazing view. I have always wanted to go to Myrtle Beach. I hope that someday I’ll be able to go here. Your photos are very beautiful. I wish I could go here now because I could use a nice vacation like this. I’ve been searching for a good resort in Myrtle Beach! This is pretty much exactly what I wanted. Thanks for the review! Growing up, my husband would often visit Myrtle Beach with his family. I have yet to go but perhaps if I show him this post, he’ll jog up some memories and will want to visit again! What an amazing place to stay! The beach looks so relaxing and I would love to check out this hotel. Oh wow. He is QUITE a hottie!!! We’re always in Myrtle Beach–my mom lives there. One of her friends stayed here and loved it as well! What an amazing resort to stay at!!! I love getting away to the beach and pools it’s the perfect way to relax! Sea Watch Resort looks amazing. It’s nice to have such an incredible view to wake up to, and a beautiful beach and pool to enjoy. That is one gorgeous place! I’d love to spend a week or two waking up to Myrtle Beach at a resort like that. Nice. Oh man, I’ve heard such wonderful things about Myrtle Beach. Looks absolutely breathtaking! Such cozy lodging too! What I would do to trade places with you! I have been itching to get my feet in the sand for months now… I swear I live in the wrong area of the country! When I travel with the kids, I much prefer to stay someplace with a kitchen. It makes life SO much easier.